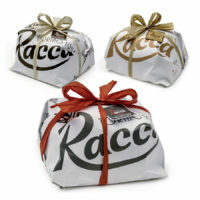 Since 1953 Mario and his family from the selected Racca Bakery of Turin produce homemade panettone today as in the past! The union and the careful balance between the best flour, eggs, butter, yeast, sugar, fruit and selected Piedmontese hazelnuts give to the Racca panettone a sophisticated taste and a real smell … the only and authentic one! Following tradition every year from mid-October, Mario, Emma, ​​Andrea and Marco start the difficult and delicate production of panettone to ensure maximum freshness over Christmas. The quality of Racca panettone is not only given by the search for the best raw materials; great attention is given to the leavening process and to the use of sourdough in water bath (the Piedmontese way) that gives to the product a high digestibility. Careful manufacturing and patient 36 hours leavening are the trump cards of the magical Racca panettone, always soft and fragrant as barely baked. Traditional Panettone, always soft and fragrant as barely baked. Barbero selects 3 types: Piedmont Classic, Moscato wine and chocolate drops.